The Uttar Pradesh state Government has the announcement for the Caste Certificate. Now, you don’t need to visit the office for the caste certificate. UP Government provides many services at online and apply for the cast certificate is the one of them to up citizens. UP Caste Certificate is given to the public who are from SC, ST and OBC Caste. UP Caste Certificate stands for taken some advantage such as Admission in School / College, Scholarship, getting job etc. The candidate can apply for the Caste Certificate at Online and Offline mode. The Candidates who want to apply for the UP caste certificate will be apply on Official Website of UP state. Interested people can apply for the UP Caste Certificate on the UP State website, Where you can check Caste Certificate status and will be download from this website provided by UP Government. This Portal designed and developed by NIC centre, that’s portal used application number with 24 * 7. When you submit your application form that time application number given to the candidate. In pursuance of Articles 341 and 342 of the Indian Constitution, were notified for the first time under the Schedule Castes Order, 1950 and the Scheduled Tribes Order, 1950, The lists of the Scheduled Castes and the Scheduled Tribes released. The Scheduled Castes and Scheduled Tribes modify List Order came into force from 29th October, 1956, which will be modify time to time. UP Government has been decided to give Caste Certificate to the some indicated caste like SC, ST and OBC. therefore people can be identify individually. The person who are from SC, ST and OBC caste will can get some advantage, financial support from UP Government. 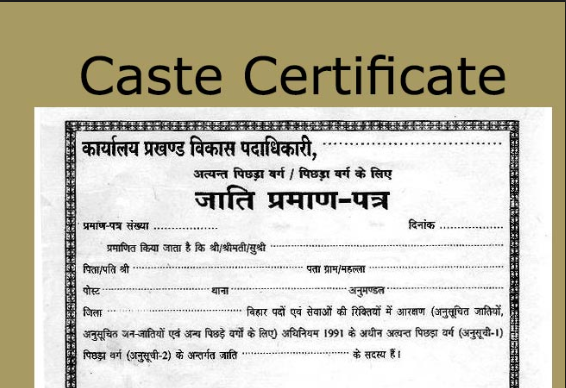 Caste Certificate is a proof of a person who belonging particular caste. As a part of the Indian system of Protective Discrimination, there exist certain special privileges granted to this SC, ST and OBC category of UP citizens. The person who are from SC, ST and OBC category has felt relax-ion and some special facility such as reservation of seats in the Legislatures and in the Government Service, waiving off a part or the whole of the fees for admission to schools and colleges, quotas in educational institutions, relaxation of upper age limits for applying to certain jobs, etc. A person who belonging any caste which listed in schedule 1 announced by Uttar Pradesh Government of Uttraranchal Anukulan avam Upantaran Order, 2001. Any person whose caste amended by the Government in schedule 1 of the aforesaid Act, he/ she can apply for the caste certificate at online mode. The Applicant/ candidate have to put up their application to the concerned authority and obtain receipt from it. Here, concerned authority of UP state is District Magistrate/Additional District Magistrate/City Magistrate / Sub-Divisional Magistrate/ Tehsildar of the area where the candidate and/or his family normally reside. To apply for caste certificate any fee are not required. The Tehsildar will get inquiry report from local Lekhpal in the prescribed format about the applicant. The tehsildar shall issue the Caste Certificate of applicant within a week. Submit your Caste Certificate from Gram Pradhan with two witnesses certifying caste. Submit Affidavit and creamy layer (Note : creamy layer is necessity for OBC only). Deposit Court fee of Rs. 1.50. pasted on proforma (Note : It is for OBC only). Uttar Pradesh citizen can download the its caste certificate by using below steps. Firstly, The candidates need to visit the website bor.up.nic.in. Then in which go to the Public Facility Section. Now click on the link The evidence tron verification. Click on the tab Certificate Verification. Enter your Certificate code on the provided box. Click on the link Check Certificate. Then you will see your certificate. If in case your filled caste certificate has some mistakes regarding personal details, when you resolve it by caste certificate verification. First of all open the link. Now you have to enter application number which generated after you are submitting your caste certificate. then you are able to verify your already filled caste certificate.